The Euro 2012 semifinalists, Germany, will play a mouthwatering high-profile season-opening international friendly with South American giants Argentina. 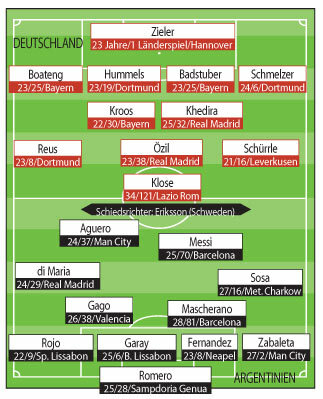 Schweinsteiger and Gomez were left out due to injury. Captain Lahm was left out due to personal reasons (his wife is about to give birth to his first child). I'd rather see Reus up front though. Match will be broadcast by ZDF. Oh god, I didn't even realize Podolski and Mertesacker aren't called up! I hope they concentrate on Arsenal, I really do. He should really try Toni Jantschke in RB. I'm sick of having CBs being played on whichever side Lahm is not on. Mazen96 wrote: He should really try Toni Jantschke in RB. I'm sick of having CBs being played on whichever side Lahm is not on. Lahm plays as RB, so really what we need is a proper LB. Perhaps he will try Schmelzer again. I hate Podolski and Mertesacker. Perhaps by extension I hate Arsenal for aiming so low as to signing those two. I read that the lineups are this but HIGUAIN will play instead Agüero. YlonenXabi wrote: I read that the lineups are this but HIGUAIN will play instead Agüero. Is that Jose Sosa, the former FC Bayern player?